This is my version of Indian food. Hurry up, curry! To make the rice, heat up some safflower oil and toss the rice in the oil on medium heat until the rice is translucent. Add the coconut milk, vegetable stock, curry and coriander. Stir to combine. Bring to a boil and then reduce to a simmer on low heat. Cover. Keep checking on it and when the liquid is absorbed, it is done. Let it sit with the cover on. To make the curry, dice the onion and saute in safflower oil. When it is translucent, add the zucchini and toss around. When they are looking nicely cooked, add the chickpeas, coconut milk, raisins, curry and coriander. Stir to combine. Simmer on medium heat so the flavors can combine. Right before you are ready to serve, add the spinach in and let it wilt as you mix the curry. This will take less than a minute. 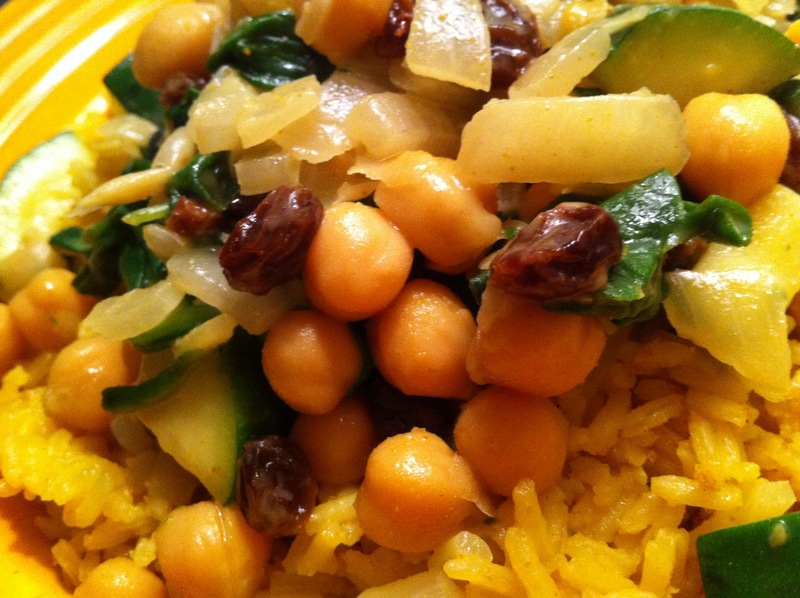 Serve the vegetables and chickpeas over the rice. Enjoy! I made this tonight… excellent! thank you.